It may be cold outside, but at VOKRA our hearts are always warm because we’re surrounded by our volunteers. This month we’re celebrating Bob Van Dusen, a volunteer who always brings a smile to our Operations Centre. I’ve been volunteering with VOKRA for almost two years now. I first heard about the organization after the loss of my sweet Pippo after 16 years together. His sister Alexandra was still with us so we were thinking of getting her a little playmate. Our vet’s office suggested going through VOKRA to find a kitty. We decided not to proceed at that time as Alexandra seemed to enjoy being the only child. Not long after she too passed and left us very sad and empty. Khloe and Fumee just a few days after being adopted. It was about a month later and we decided we needed to fill our home once again with kitty love. 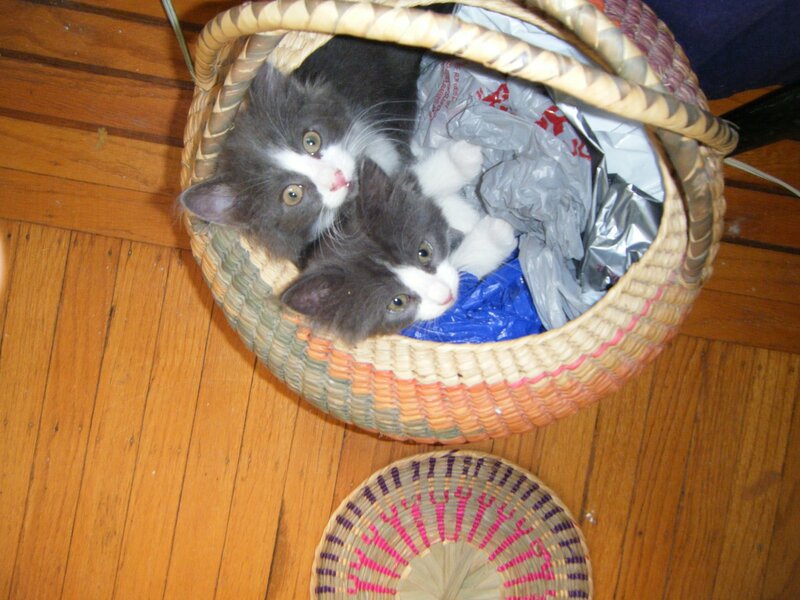 We of course remembered VOKRA and looked on the website and found the kitties that would become part of our family. Khloe and Fumee are now closing in on seven years with us. I wasn’t working during the first few years after we adopted them and needed something to occupy some of my time. As I’ve always been a huge cat lover I applied to volunteer with VOKRA and was contacted regarding a position at the front desk which I accepted. My initial contact with VOKRA was with Monique who spent a lot of time with me getting me up to speed with all the responsibilities of the front desk and how we contribute to the overall smooth running of the VOKRA machine. I can’t say enough great things about Monique. She’s more than a mentor/teacher, she has become a confidant, therapist and friend. As time passed I took on more responsibility and joined the financial team in a very limited capacity which I enjoy very much. I’ve strived to learn as much as I can about the different areas of VOKRA so I can be of use when a need arises. Being a part of the VOKRA family has done so much for me as a person. The amazing people who are a part of this organization have welcomed me and I truly feel like I’ve gained a new family. I have met so many wonderful kitties during my time at VOKRA. Of course, Charis is a particular favourite as she was one of the first kitties I met on my first day. My sweet Kaspurritto stole my heart in a big way. Most recently the darling Poppy tugged at the heart strings and am so happy to see her doing so well in her foster home. So many more I’ve wanted to bring home and all have such a special place in my heart. One memory stands out right now. One Tuesday morning before my 2 p.m. shift I received a call from the morning receptionist Jennifer to ask me a favour. 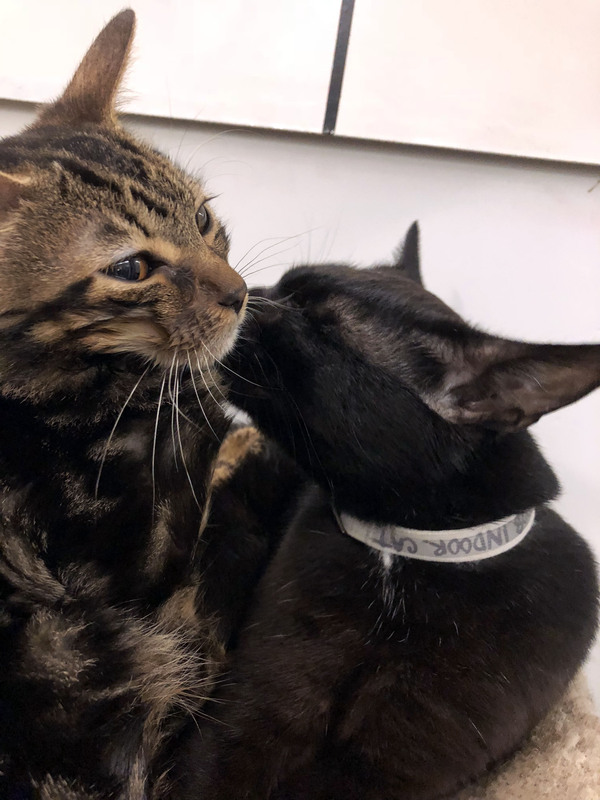 The vet clinic on Davie Street had been visited by a young man who was wanting to have his 12-year-old kitty euthanized for some behavioural issues. The clinic refused and found out he had been shopping his cat around the downtown clinics, all of whom thankfully refused. The clinic on Davie contacted VOKRA’s Operations Centre to see if we would be willing to take him in as the owner was just going to dump the cat in the wild somewhere. Being VOKRA, of course they said yes. The young man was contacted and surrendered his kitty at the clinic. My small part was to pick him up and bring him to Ops. None of us saw evidence of the “issues” his former owner had described. It’s a testament to the dedication of VOKRA that C’Fer is flourishing in his foster home and hopefully will find his furever home soon. I just feel so fortunate I was able to contribute in my way to saving this wonderful cats life. Finally, I want to thank Karen and Maria for creating VOKRA and a place where kitties and humans can become the best they can be. My life has been so enriched by being a part of this organization. So many others inspire me with the dedication and hard work they put forth for VOKRA. 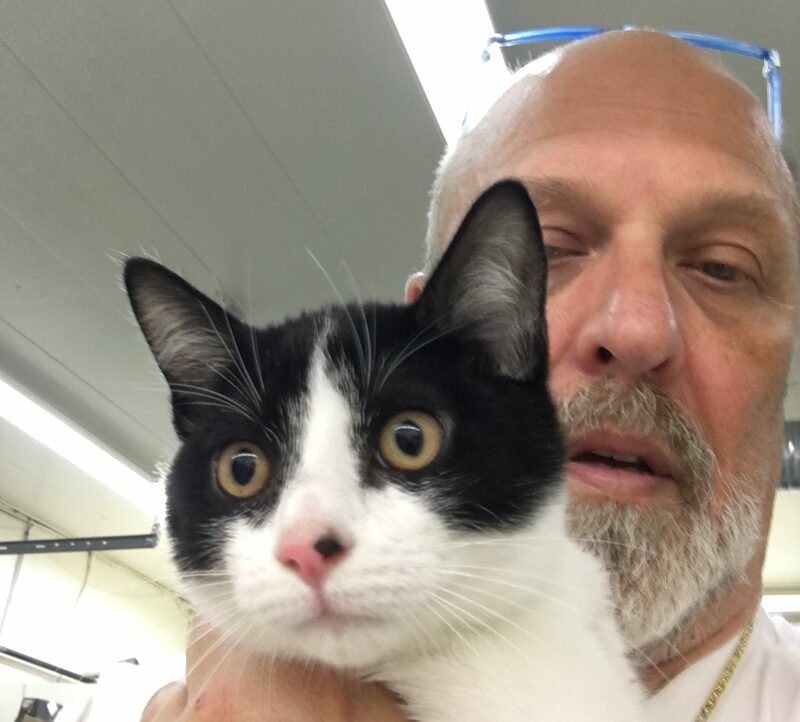 THANK YOU Bob for all your dedication and the time and energy you put towards helping the kitties of VOKRA. We couldn’t be more appreciative! VOKRA is always in need of volunteers. If you’re interested in volunteering with us visit our website at vokra.ca/volunteer. Some say January is the dreariest month, but at VOKRA we have hundreds of volunteers who continually brighten our days. This month we’re celebrating Sean St. Pierre, a volunteer who brings his heart and soul to VOKRA each time he gets in his car. To be honest, when I was contacted about being selected as Volunteer of the Month I was completely overwhelmed with emotion. 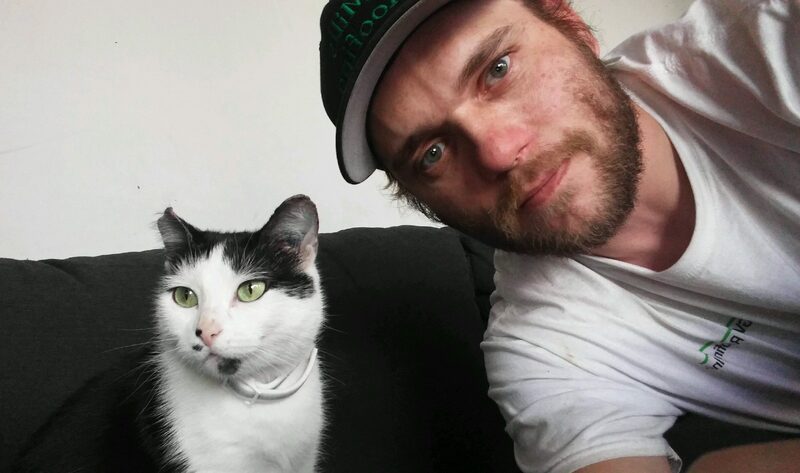 Every minute I volunteer at VOKRA is in memory of my two rescue cats who passed in 2015. Mr Pickles passed on Oct 30th at home in my arms, due to having cancer. He was in my life for more than 13 years and was my best friend and I still think about him everyday. He helped get me through some very difficult times. Unfortunately two months after Mr Pickles passed, and three days before Christmas, my little guy Ace lost his life due to a tragic accident at the age of two. He was so beautiful and was a major part of filling the gigantic hole left in my heart from the loss of Pickles. I was also injured during the incident and missed six weeks of work. It was during this time when I was off work when I stumbled upon the VOKRA website. At first, I was looking every day for a new addition to bring home, but after some time and discussion with my spouse, we decided that taking on any more cats was not the best move for the time being. We continue to spend our energies on our surviving senior cat Bubba. That being said, I still found myself going to the VOKRA website daily and it made me sad that so many beautiful animals were in need of finding the right home. I thought about all the happiness my two rescues brought me and how I could somehow help out at VOKRA. So I checked out the volunteer page…. Due to my super busy schedule with work and chief shop steward duties, I figured starting out as a driver would be best suited for me at the time. In the two and a half years I’ve been with VOKRA, I’ve done almost 200 rides. Some are just supply runs to fosters, others are rides to get some of our new arrivals fixed, but my favorite rides are bringing cats to their new fosters. 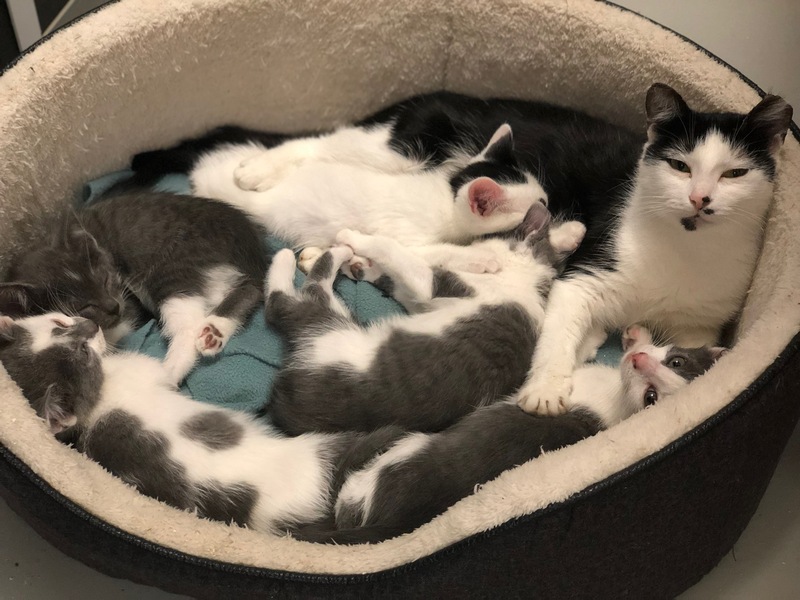 It feels good knowing we’re providing a new chapter in these cats’ lives and the fosters always have a big smile waiting for their new temporary family member. It always tears my heart out when I get the senior cats for transport. I have a soft spot for them. Either they’ve been abandoned or have spent most of their lives on the street and just need a good home. Sometimes they’re beat up and look really rough. They just need a break. Those are tough rides. I’m hoping there will be a point in my life where I can take on more responsibility at VOKRA, whether it be fostering, cat care or even joining the trapping team. Being a non-profit volunteer-run facility, they really need all the help they can get. I’m looking forward to the years ahead, not only with the cats but all the wonderful volunteers that I cross paths with. THANK YOU Sean for all your hard work and dedication and for turning your loss into something positive. Little Spring, the kitten we’ve been telling you about, has very sadly passed away. Her short life, and her close friendship with bestie Hamburgler, were a heart warming inspiration to us all, say many VOKRA volunteers. 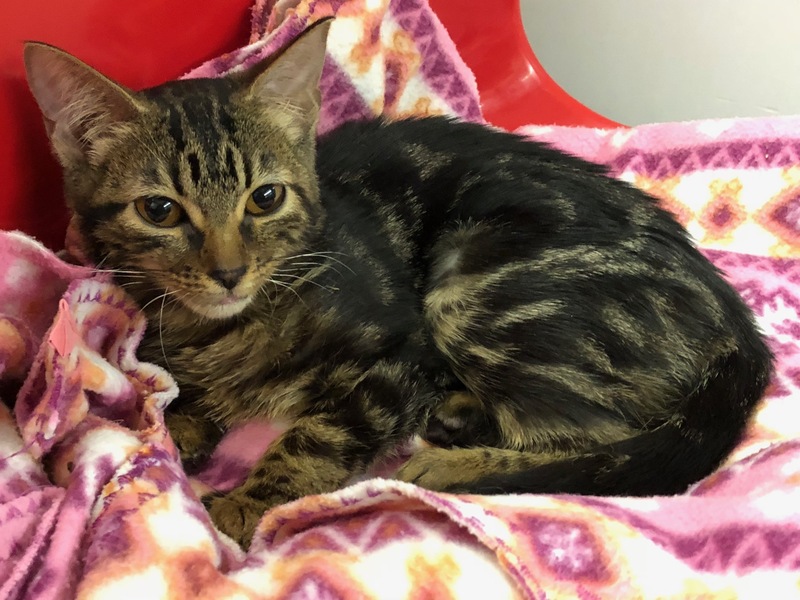 Spring was born with an inoperable genetic defect, a portosystemic liver shunt, a disorder in which a cat’s blood supply bypasses the liver, leading to increased toxins in the blood. 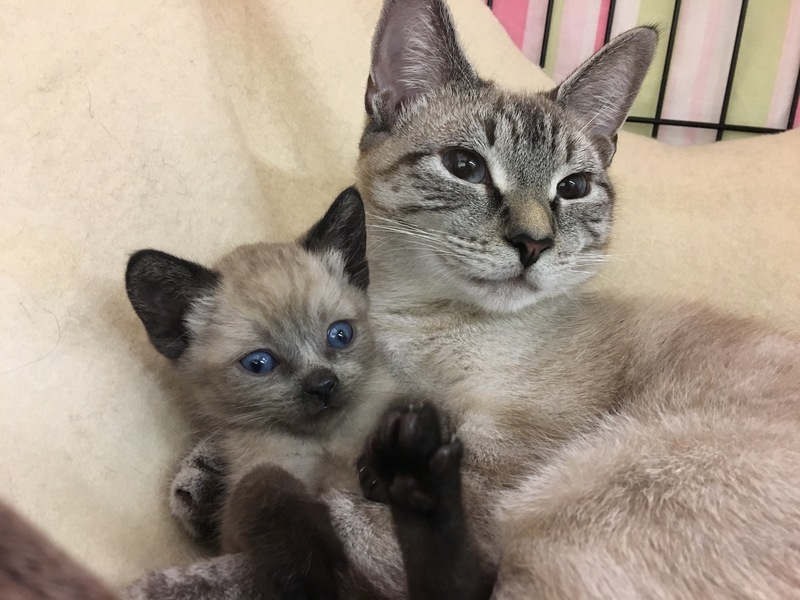 Most kittens with this condition die within weeks of birth, so Spring’s relatively long life (she was 5 months when she passed) is an amazing tribute to VOKRA’s good care. At first, volunteers at VOKRA’s Operations Centre weren’t sure how long this tiny kitten would be around. At a few weeks of age, Spring wasn’t thriving. She crouched in her cage, too nauseous to nibble on her food or even nudge the hands of volunteers who reached in to pet her cute self. After a vet visit or two, she seemed to recover and our volunteers made a momentous decision. 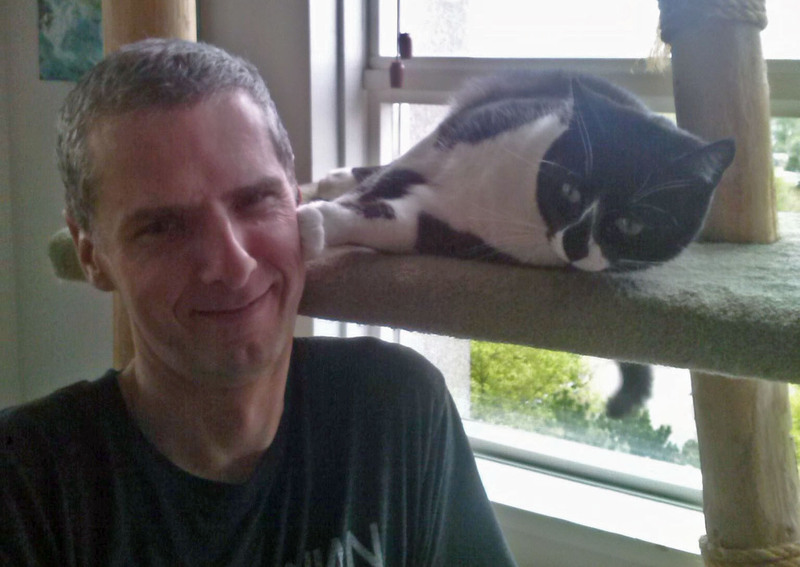 Another adorable feline had just been rescued from life on Vancouver’s streets. 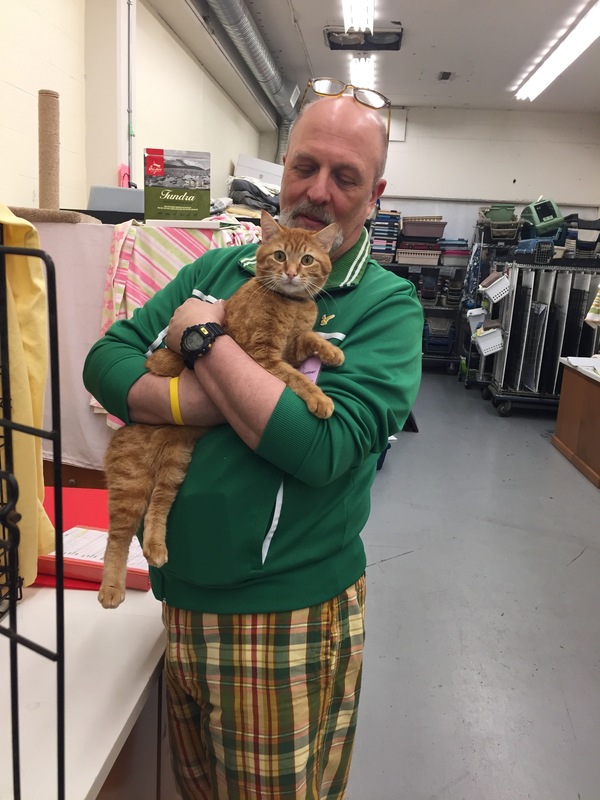 This cat, named Hamburgler as he was found hiding under a McDonald’s dumpster, was paired with Spring. At first, Spring was hesitant. Following some much-needed treatments, Hamburgler had become a happy rambunctious kittie, always wanting to play. He pounced on the little kitten, delighted to spot a new playmate. But Spring soon learned to give as good as she got. On her healthy days, she and her new bestie chased each other around. On not so good days, Hamburgler began to help his friend, supporting her through her struggles. Hamburgler even provided comfort on Spring’s worst days, when her health problems necessitated trips to the vet. Hamburgler now has his own happy ending. He’s been adopted by VOKRA volunteer Leanne, who kindly waited to collect her new companion until Spring was no longer in need and then rushed in so Hamburgler would not have to spend a night alone in the pod he and Spring shared. Spring’s fighting spirit, and her connection with Hamburgler, will linger in our minds for a long time. The rains have arrived and it’s time for all kitties to come in out of the cold. Here at the VOKRA, we work hard everyday to make sure cats who have no place to go have a roof over their head when the weather takes a turn. Until recently, if you called “here Kitty Kitty” at our Operations Centre you’d have probably been talking to a single cat, an elderly gentleman named (you guessed it) Kitty Kitty. This poor guy wouldn’t come running in answer though, as he has several age-related conditions that affect his mobility. He’s hyperglycemic and has arthritis in the lower part of his spine. When Kitty Kitty first came to VOKRA he couldn’t walk very well and our volunteers were concerned he was in a lot of pain. Everyone worked hard to find Kitty Kitty the right meds to help him move more comfortably. Unfortunately, to make matters worse, Kitty Kitty started out not too relaxed in his temporary home and he had a tendency to nip. But after some medical care, and lots of cuddles and chin scratches from the team at Ops, Kitty Kitty started feeling much better. He’s still not the most agile of kitties, but he’s getting around and any volunteer or visitor who came to the back room where Kitty Kitty was staying was sure to be greeted by hopeful eyes and a little paw reaching out. After Kitty Kitty’s temporary stay, he’s happier and healthier and has now moved on to a new home. 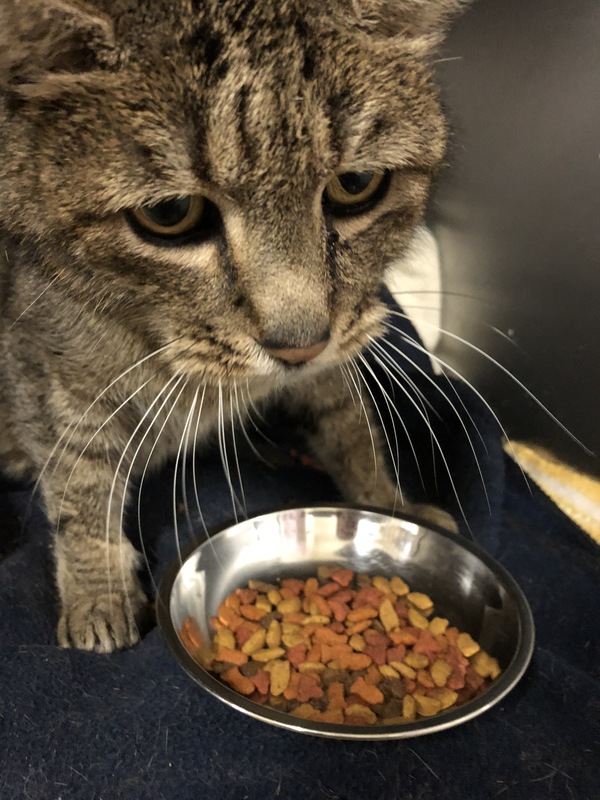 Everyone will miss this super senior, but we’re glad we were able to ensure Kitty Kitty stayed warm, dry and loved while he was waiting for a permanent situation to come along. If you’d like to help us help more kitties like Kitty Kitty, please donate today at www.givetovokra.ca. Fall?! Not at our Operations Centre. It’s still springtime at Ops! 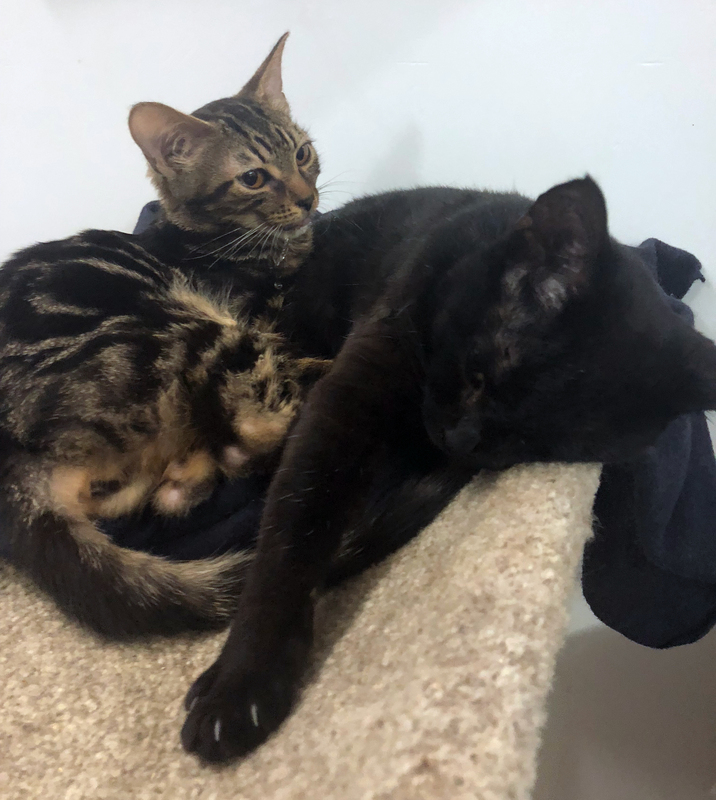 Spring, the kitten we first told you about last month, has had her ups and down, but the good news is she’s found a special friend. Little Spring is still getting her share of human attention, as our staff and volunteers continue to help her with her troublesome kidneys. But now Spring has some kitty love too! Her new ‘bestie’ and health helper is Hamburgler, an eight-year old cat rescued by VOKRA back in June of this year. Like Spring, Hamburgler had a bit of a rough time before VOKRA came into his life. 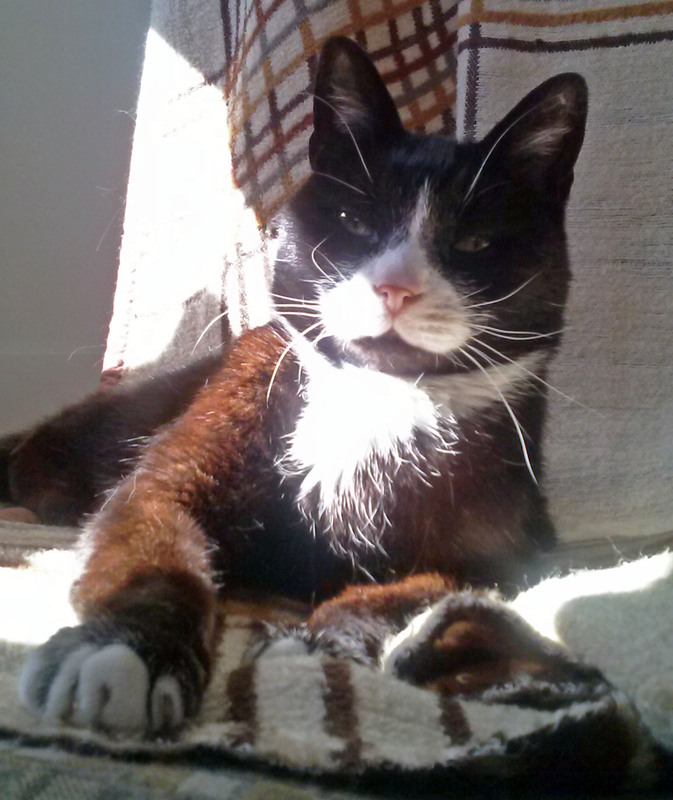 As one of Vancouver’s many stray cats, Hamburgler was often hungry and sick. 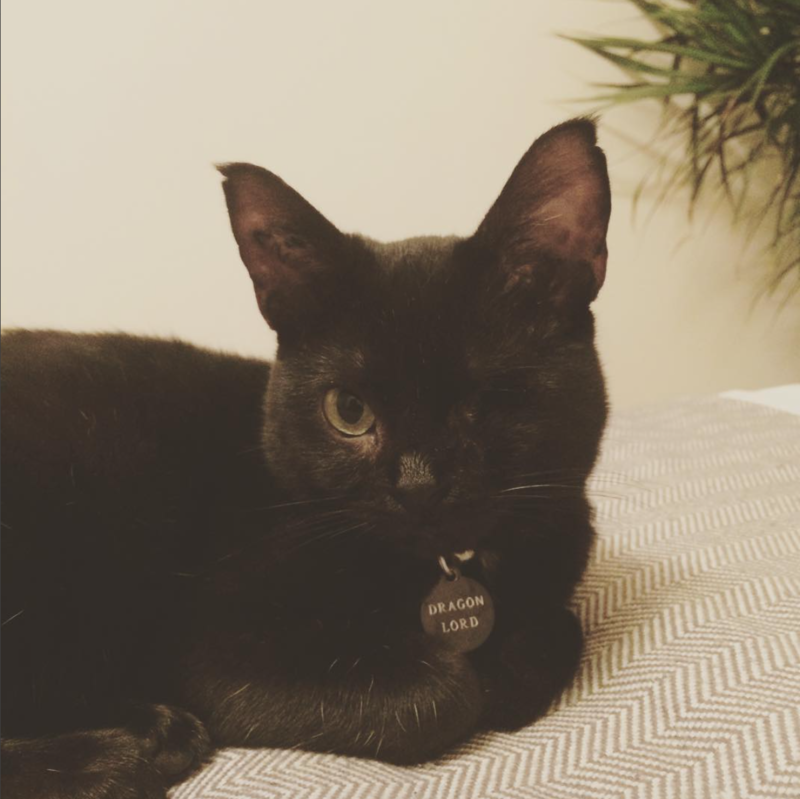 When VOKRA volunteers found him, he was crouched under machinery in a shed behind a MacDonald’s restaurant, covered in fleas and with a serious infection in one eye. 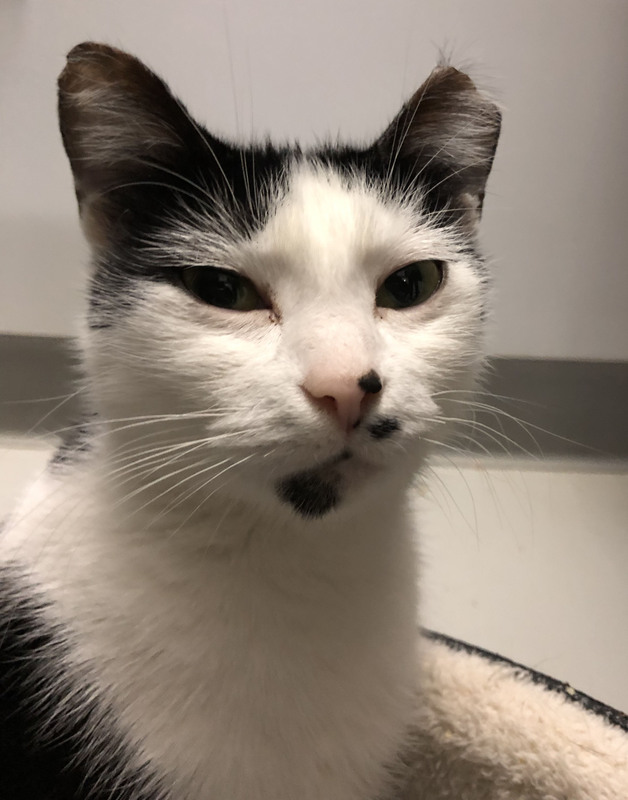 Both Spring and Hamburgler ended up at our Ops Centre where they’re getting the care and love they need, and then someone had a bright idea. 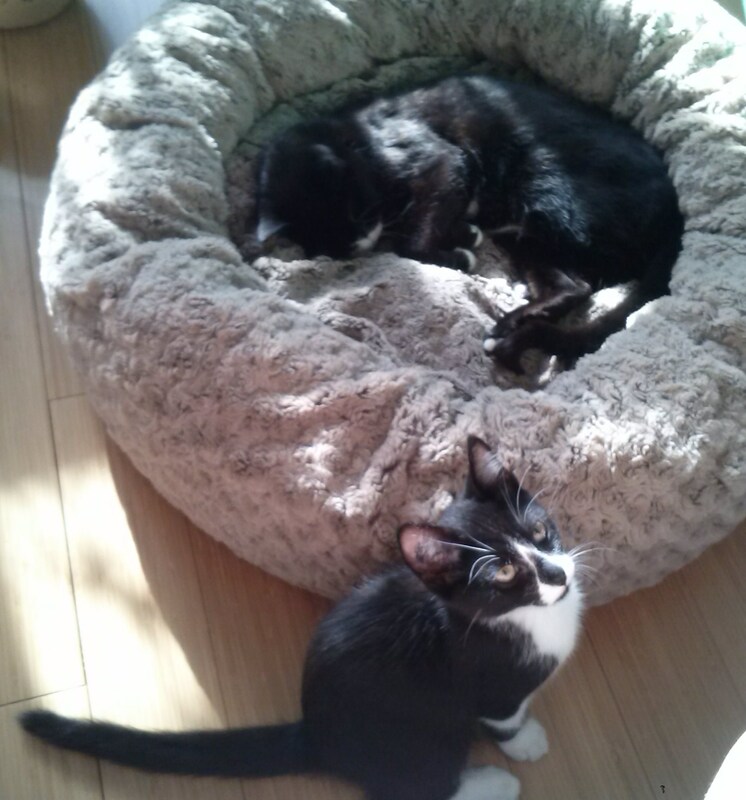 The health of both cats was stabilizing, but they seemed lonely. Why not room them together? At first, Spring wasn’t sure what to make of her new stepbrother. But Hamburgler immediately started nudging her to play and soon brought her out of her shell. It wasn’t long before the pair were tossing toys around, touching noses and snuggling up together. 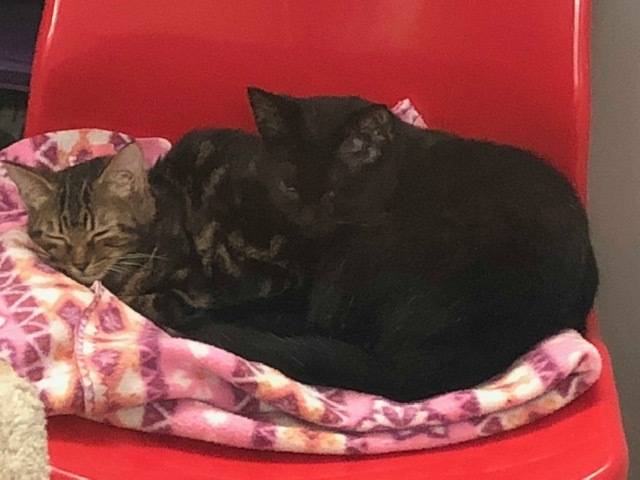 The sight of the happy twosome cuddled on a cat tree is one of the highlights of a shift at Ops for many a volunteer and staff member. The coming months may still bring some cold weather for these kitties. Spring is not entirely well and most recently she took another bad turn requiring yet another emergency trip to the vet. She will be returning for another vet visit soon for an ultrasound as we continue to diagnose her issues. And Hamburgler could have more problems due to his years on the streets. But for now they keep each other warm with the help of everyone at VOKRA and each other. 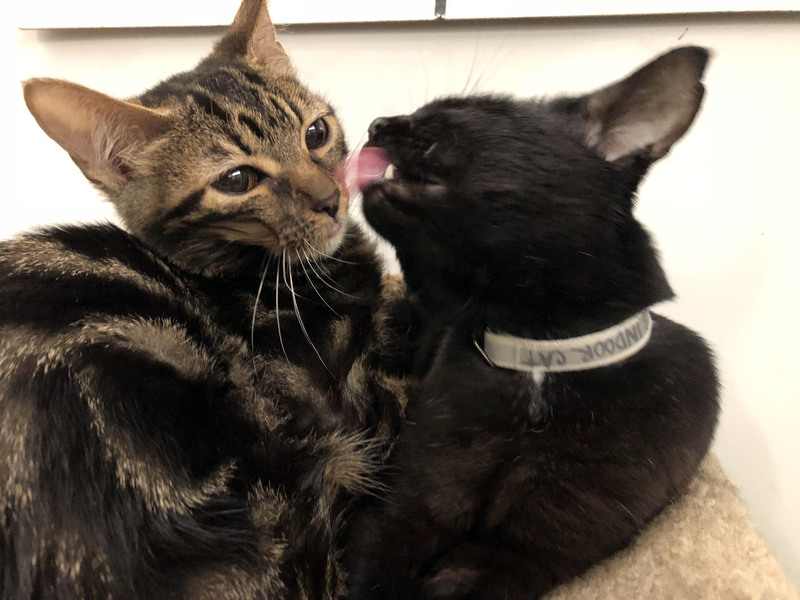 Spring and Hamburgler are just two of the thousands of reasons why we Walk for the Kitties. Each year, VOKRA rescues more than 1,400 homeless cats and kittens from around the Lower Mainland. Unlike many other animal rescue groups, VOKRA is a volunteer-driven, no-kill organization. Our work is made possible through the generous support of volunteers, adopters and people like you. Medical care accounts for more than 50% of our annual budget. Without your support we wouldn’t be able to afford to rescue all these cats and kittens. 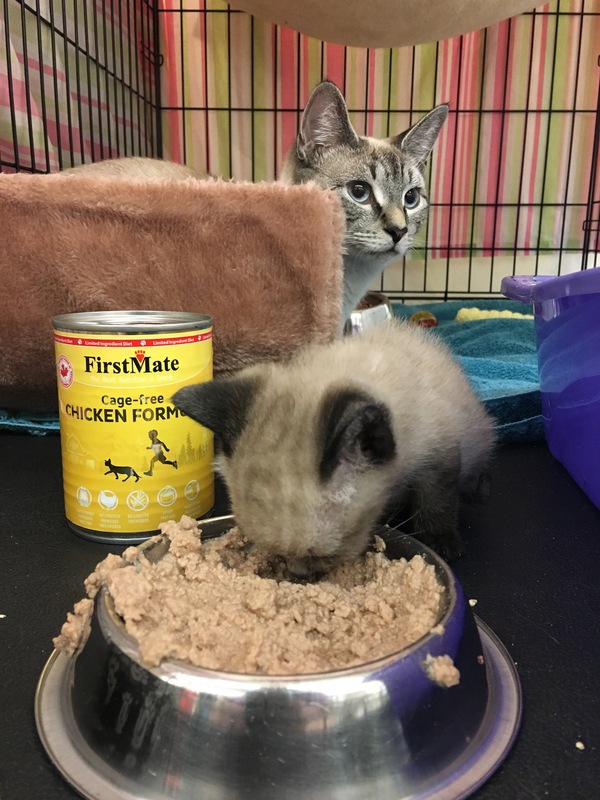 Please help us help kitties like Spring this September 16 by joining us for Walk for the Kitties, presented by FirstMate. Walk for the Kitties is our largest fundraising event of the year. 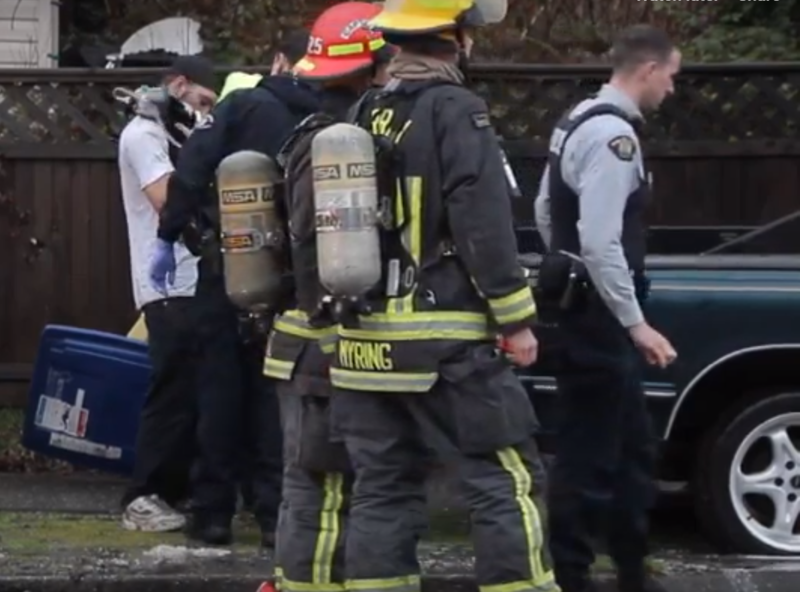 This 5k fun walk takes place at Jericho Beach and all funds raised go directly towards supporting our rescue efforts. Learn more here. Can’t make it on September 16? You can still donate today! At VOKRA, we do our best to ensure all kitties who pass through our doors live the best lives they can. That’s why when we come across issues we always look for a pattern and try to find a solution. 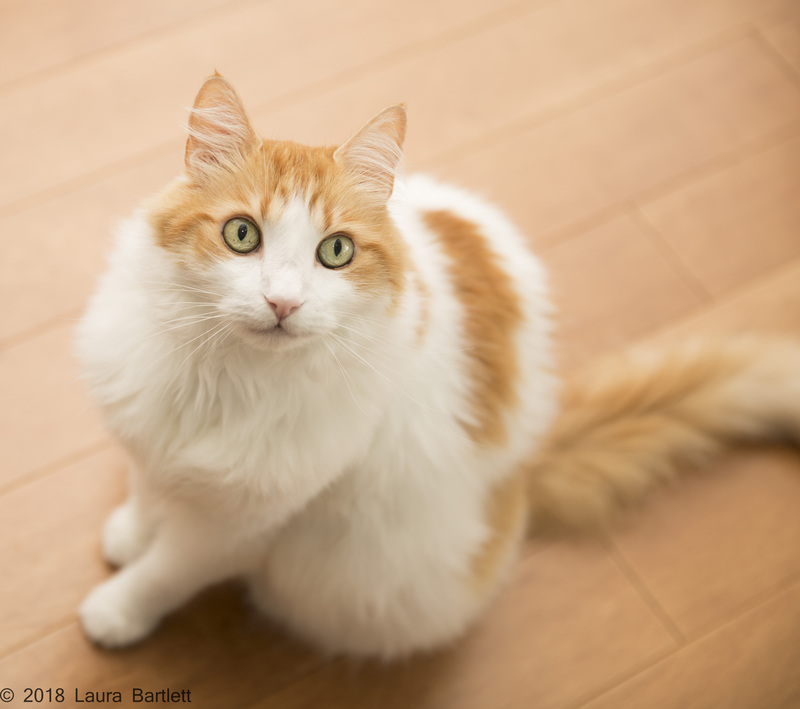 Unfortunately, from time-to-time cats are returned to us due to behavioural issues, and the most common of these issues is peeing outside of the litter box. More times than not, the root cause is diet and stems from the fact the cat is fed primarily dry food. Cats who eat mostly dry food also tend to have more urinary tract infections. And cats that are free fed, which is when food is left out for the cat to self-monitor their own diet, have it even worse as they’re often fat so they can’t clean themselves properly. So, why is dry food the culprit? Cats are designed by nature to be carnivores and their digestive tract, despite thousands of years of domestication, is not intended to assimilate dry food. Not only so, contrary to popular belief, dry food causes plaque to form on teeth. It’s also highly processed, making the body work anywhere from 12-18 hours to break it down. This means the cat is always half full and in a constant state of digestion. On the other hand, raw food moves through the body within four hours, while wet food takes 8-12 hours for the body to metabolize it. All of these reasons are why we feel so strongly about feeding cats a diet that primarily consists of wet or raw food. So if your kitty is peeing outside of the box, has frequent urinary infections or stinky breath it will most likely be worthwhile for you to switch their diet away from dry. It will help save their health and will cost you less trips to the vet. If you’d like to learn more about why wet is best click here.